Many faithful fans return every year to watch and cheer at the extremely popular event featuring teams of two attempting to assemble a V8 engine in the fastest time. Using the same engine blocks, hand tools, & engine parts, these teams will assemble an engine from parts to running in less than 10 minutes as they compete for their share of over $6000 in trophies, cash & major merchandise prizes provided by our many sponsors. Three Chevrolet 5.0-Liter V/8 TBI fuel injected engines will be used. The engine short block will be pre-assembled, (crank, rods, pistons) leaving the cylinder heads, Timing components, lifters, push rods, rockerarms, intake and exhaust manifolds, all the sheet metal components as well as the ignition system to be installed. The Battle of the Automotive Technicians started at Kelsey in 1991 as a challenge between the Automotive Service Technology program, the Agricultural Machinery Technician Program and the Heavy Equipment Mechanics Program which was used as a promotion during Kelsey Days (open house for high school students). As the excitement at the competition became known to the many schools, it became the largest attraction during their two day event. As the popularly of the competition increased, so did the participation of businesses with their donations of prizes for the competitors and winners. Now, taking place at the Draggins Annual Car Show, the prizes are better than ever making this a very exciting competition. 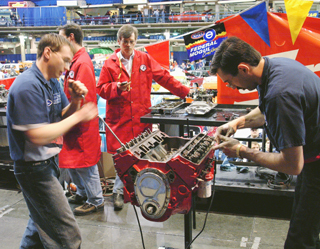 Races consist of two teams with two members each, who are required to assemble a 350 cu. in. Chevrolet engine. All parts are laid out in a specified order on the bench, with no assembly allowed on the bench. Engines must be assembled with all parts supplied and run for 5 seconds With hands free of the engine. Penalty times are added for loose bolts and/or incorrect assembly. The only parts not requiring installation are the crankshaft, Camshaft, Valves and spark plugs. The Winners, declared by fastest times of each heat will advance to the finals to be held on Saturday.